Well that's a random little factoid, isn't it? Not sure that it actually relates to anything about this toy, specifically, but hey, who are we to judge if they needed some extra chatter to take up space? Freaky Fullback is clearly a big believer in tradition, because the modern version is a guy with blue skin and an orange helmet, just like he was for Art Asylum a decade ago, and for Amtoy three decades ago. He does need to take better care of himself, though: what was once just a slightly purulent left eye is now nothing but a mass of green pus. Eww! 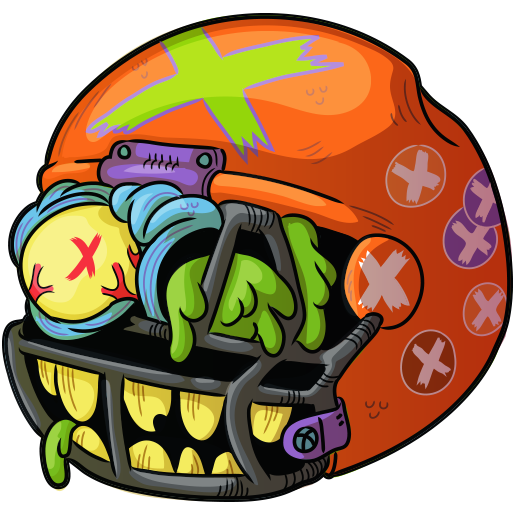 The helmet isn't doing much to protect his mouth, either, judging by the crooked and broken teeth. 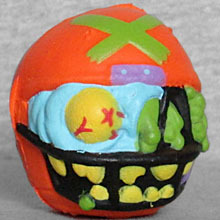 There's a deep dent on the left side of the helmet, and a crack on the right. 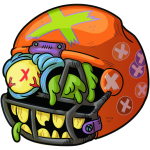 Apparently Freaky Fullback plays for the X's, because that's the only decoration to be found on his helmet: a big green one on the front, and a white one in a purple circle on the back. There are more little stickers on the sides, but those don't get painted here. Additionally, the underside has details that I think are supposed to represent his severed neck? There's no paint there, either.